When you saw those two names – Achim Wollscheid and Bernhard Schreiner – side by side on a piece of paper, you probably thought "Of course, this collaboration makes so much sense!" Unless you went "Who?" 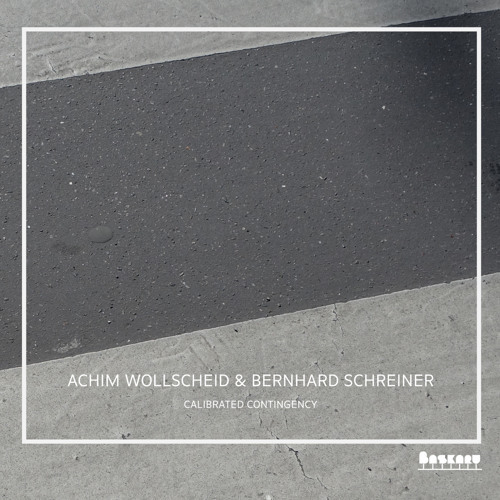 True, Wollscheid and Schreiner are not what you would call household names of the experimental music scene. Although the former gained serious "street" credit on the Industrial scene in the '80s with his moniker S.B.O.T.H.I. and his collaborations with P16.D4. Wollscheid also cofounded the influential production company/label Selektion. And in the '90s and early 2000s he published a string of brilliant albums of computer music and avant-garde electronics on Selektion and Ritornell. For the past ten years, however, he has released very little music, focusing instead on sound art installations. Schreiner is a photographer, filmmaker, installation artist, and musician. Like Wollscheid, he presents many more exhibitions than he releases records, and his work in both realms shows strong affinities with the Selektion man. Calibrated Contingency consists in a continuous 47-minute live performance recorded in Graz in 2011. Both artists are using a computer and minimal external input devices (a boundary microphone, an induction coil, a radio). At the performance, each had a pair of stereo speakers, and all four speakers were arranged in a single line. This CD presents a stereo mix of that performance. And what a performance it is: a complex fabric of mangled frequencies, raw electricity, odd sounds, clips and glitches, woven loosely, with silent holes here and there. Dizzying and otherworldly... ...but isn't that what the sound of our world should sound like?